PostgreSQL can be deployed as modern cloud application. Running a database server in a public or in your own private cloud envirement can contribute to significant cost reduction and reduced administration overhead. PostgreSQL is ready for the cloud and Cybertec provides hands on assistance to maximize your efficency. Cybertec allows you to benefit from our pool of cloud experts. We help to install, run and manage your PostgreSQL/Kubernetes infrastructure. Kubernetes is a high-end cloud infrastructure which allows you to run docker containers easily. Docker containers can be deployed and scaled automatically which reduces cost and increases efficency. On modern systems PostgreSQL is often running inside a docker container. Although docker is a relative new technology. It has been rapidly adopted by the industry and has found its way into many big cooperations which rely on docker for additional abstraction and easier deployment. Usually Linux is the main plattform for this purpose and constitutes a solid foundation for professional businesses. In medium and large enterprises PostgreSQL and Kubernetes can serve as a database plattform to run and manage hundrets or even thousands of database servers cheaply and effectivly. Due to the nature of PostgreSQLs liberal license you can run as many PostgreSQL instances as you want, without having to worry about costs. Containers can be deployed within seconds which gives you an edge over traditional unflexibel commercial database vendors. 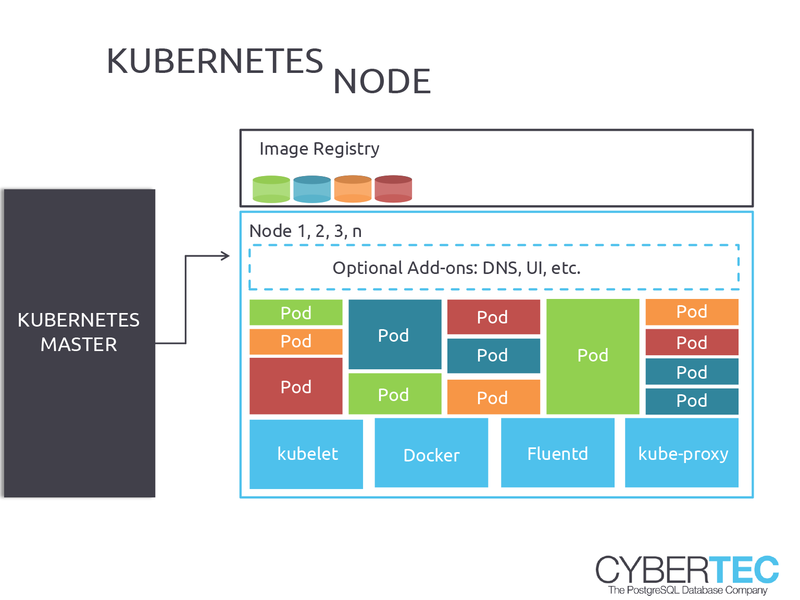 Cybertec provides 24/7 support for your PostgreSQL deployment with docker and Kubernetes. In modern IT high availability is not a nice to have anymore – it is a fundamental requirement. While downtime was still somewhat acceptable years ago, it is certainly not anymore. Customers are used to around-the-clock availability. Cybertec provides solutions to run PostgreSQL in a container on Kubernetes in state of the art database clusters. Imagine running hundrets or thousands of database instances simultaneusly. Without proper monitoring, this is clearly impossible or simply to expensive. Cybertec offers a PostgreSQL monitoring tool called pgwatch2. It can be downloaded freely as docker container and is therefore the ideal solution to monitor and manage a large scale PostgreSQL infrastructure. It features pre-defined graphs and matrix. It can be deployed out of the box for PostgreSQL 9.6 and higher. Everything is ready for your cloud. If you are planning to use PostgreSQL with docker and Kubernetes, we are happy to share our experiences with you.